This edition of World-Wide Wednesday focuses on the baby names of Scandinavia. This includes the three kingdoms of Norway, Denmark and Sweden. These three countries are also categorized as Nordic countries along with Finland, Greenland, Iceland and the Faroe islands. There is plenty of overlapping influence between the countries that sometimes is translated into their baby names. Most baby name sites group all of these together as one overall "origin" called Scandinavian names. In general, surnames, or "heritable family names", weren't used often in Scandinavia until rather recently in comparison with some other countries. In Denmark, an act was passed in 1526 that made families of nobility have to begin using a heritable name. High class people followed suit during the next few centuries and finally everyone else did later. They followed a patronymic naming tradition that gave the father's name to the children with the suffix "-sen" added to the end. For example, the son of a man named Jens would be given the surname Jensen. There have been many naming acts passed since 1771, that made citizens have to give up traditional primary patronymics in favor of choosing a single patronymic surname to use as their heritable family name. What resulted was an overwhelming dominance of a few specific surnames. About one-third of the Danish population have one of the ten most common surnames. More than two-thirds of people have a patronymic name that end with -sen. However, in 2005, Denmark ruled that people could once again use patronymic surnames as a replacement for or in addition to traditional surnames. In Norway, the most common surnames were also patronymic and usually ended with either "-ssen", "-sson", "-sdatter", or "-sdotter" with the first two referring to a son and the last two referring to a daughter. For example, the daughter of Jon would be given the surname Jonsdotter while her brother would be called Jonsson. In more recent times, the extra S is often dropped: Hansen instead of Hanssen. In 1923, a law was passed that made each Norwegian family choose a single, hereditary last name. Any surname that is derived from a place name usually originated as a farm name that was sometimes taken instead of a patronymic one. However today, place names are much more common than a patronymic name. The popular farm names tend to include either Bakke/Bakken meaning "hill or rise", Berg/Berge meaning "mountain or hill", Haugen/Daugan meaning "hill or mound", Dahl/Dal meaning "valley", Lie meaning "side of a valley", Moen meaning "meadow" or Rud meaning "clearing". Since 2002, the option of using patronymic surnames was once again available. Swedish surnames are originally patronymic with the most common ending being "-sson". However, in 1901, an act was passed that abolished the practice of handing down patronymic names. Everyone one had to have a specific family surname that was inherited by each generation. Swedish families tend to like names that have to do with nature. A few examples include Lind meaning "linden", Berg meaning "mountain", Dahl/Dahlin meaning "valley" or Alström/Ahlström meaning "alder + stream". They sometimes build into the family name information about where the family came from. For example, the Strindberg family came from Strinne. There are also some family names that have to do with war such as Skarpsvärd meaning "sharp sword" or Sköld meaning "shield". Since 1982, they've been allowed to use patronymic names again. In Iceland, they still use patronymic surnames almost exclusively. There are a few heritable surnames passed down, but nearly all Icelanders follow the patronymic method of naming. This includes giving sons the suffix -son and daughters get the suffix -dóttir. Iceland is very specific and picky about which names parents are allowed to use. There is a Naming Committee that must approve names, especially new ones that have never been used in the country before. The names must be easily used in the Icelandic language and use their alphabet, and they have to be gender specific. Nearly everyone has their father's name incorporated into their last name, but occasionally, matronymic names are used instead. This occurs when the child is to have no social tie to the father or if the mother wishes to make a social statement. Now that we've covered how naming traditions generally work now and in the past, let's take a look at some examples of Scandinavian baby names. What do you think of Scandinavian names? Do you have a favorite? Share your thoughts in the comments below!! [Note:] I am not Scandinavian and I've never been to that part of the world. If any of this information is incorrect or lacking, contact me so I can adjust it. 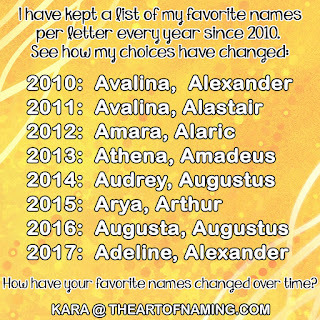 Kick Off The New Year With These Baby Names! What Are the Best Names Within the US Top 100?